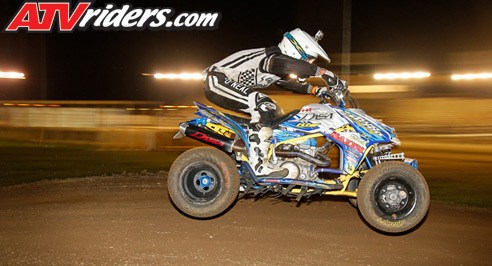 Shelbyville, IN – The 2015 Extreme Dirt Track ATV racing series headed to Shelbyville, Indiana for rounds three and four of the series at the Shelby County Fairgrounds. The week leading up to the race was saturated with rain showers, some with record rain fall in the area. This resulted in a very sloppy track which was not able to be touched to work on until later in the weekend. Because of this, round three, which was slated for Friday was canceled, and round four was ran on Saturday, which completed the weekend. 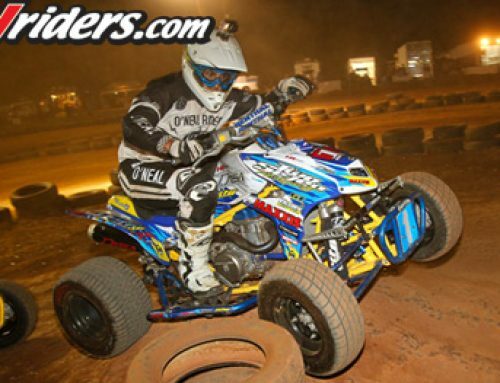 “Bad” Brad Riley was at it again in the Pro and Pro-Am classes coming away with wins in the both the Pro and Pro-Am classes. 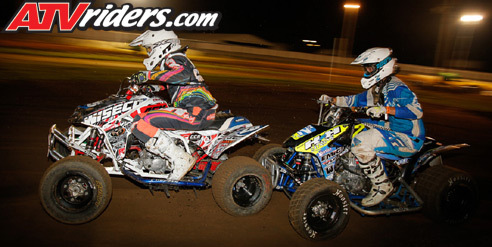 In the EDT Racing Pro Main, Two Se7en Motorsports / Houser Racing / MAXXIS Tire’s Brad Riley got off to a third place start behind Nathan Wolff and Chuckie Creech who took the holeshot. Before the full-completion of the second lap Riley got tangled with Creech as they rounded a corner sending Creech to the ground. This caused a red-flag restart which forced the racers to line back up to the starting line area. Riley got off to a second place start for the restart behind Wolff. Riley trailed Wolff, studying his moves and lines for the next eight laps until he was able to make the move to take over the lead on the tenth lap. After the pass, it was full-speed ahead for Riley as he kept up his speed over the rough track to go on and take his third straight win of the season. 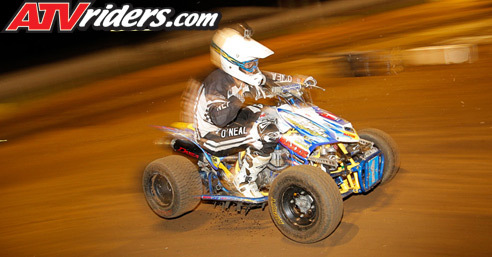 “I really didn’t mean to get into Chuckie (Creech), and it messed up his run for the podium in the class, but we were racing hard, and I’m glad he’s okay and was able to keep racing. I got a good restart and was able to stay right on Wolff as we both headed into the first corner one-two. I trailed him for a while and then got around him into the lead and went on to take the win. I want to thank my sponsors who helped me to get to the top of the podium. 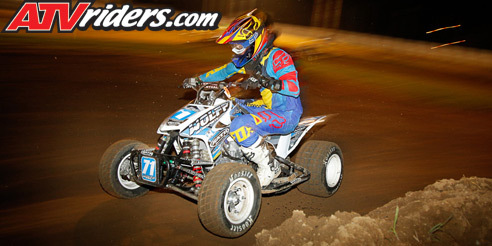 My MAXXIS tires were hooked up on the loose track and my PEP shocks kept me going smooth even though the track was super rough. It was a tiring race with the restart, but we came out on top with another win, and I extended my points lead,” said Riley. Wolff Motorsports / DASA / Hoosier Tire’s Nathan Wolff grabbed the holeshot for the restart of the Pro Main followed closely by Riley. He was able to hold off Riley for half the race, but in lap ten, he dropped back to second place. After the pass, Wolff stayed true to his lines and remained mistake free for the rest of the race to complete the twenty-lap race in second place, which was his best Pro EDT racing finish of the year. Earnhardt Racing / TRE Engines / Hoosier Tire’s Michael Houghton was very consistent throughout both starts coming out of the holeshot initially in fifth place. After the restart, Houghton found himself in fourth place behind Garret Keister, but was hot on his heels early on and was able to make the pass into third place. Houghton stayed on the throttle and caught up to Wolff and was closing in, but he didn’t have the drive needed to make a run for the second place position and settled for the third spot on the podium. The Pro-Am Unlimited class and the Pro-Am were run together for this round as there were only two racers in the Pro-Am class, Chuckie Creech and Brad Riley. 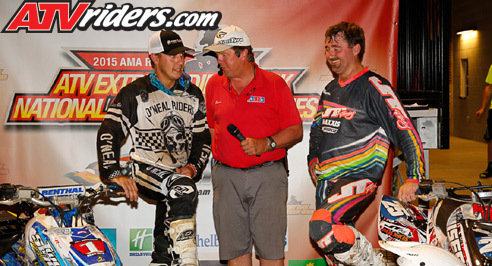 Riley was able to stay ahead of Creech throughout the entire fifteen lap race to come away with his third Pro-Am win of the season, while Creech earned an easy second place finish for himself as well. 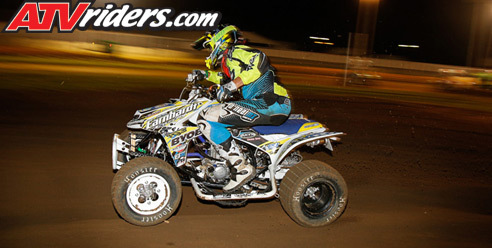 Walsh / Custom Axis / Maul-Tech ATV’s Nathan Wolff had a great showing in the Pro-Am Unlimited class as well coming away with the win but it wasn’t as easy as just getting out front off the start. Wolff had to battle his way to the front after getting off to a mid-pack start and was into third place by the end of the first lap. Daniel Chepkauskas was out front with the holeshot but quickly came under attach by Houghton in second place and Wolff in third who were both pushing for the front of the pack. Once around Chepkauskas, Wolff still had to deal with Houghton who was now the leader. 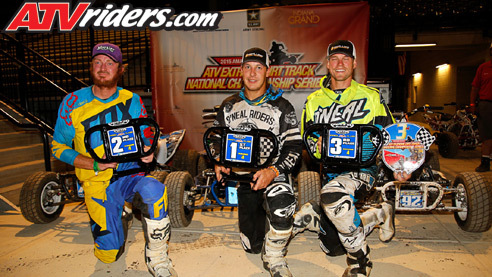 Setting his sights on the top step of the podium, Wolff pushed himself to get around Houghton before the fifteen laps had come to a close and secured the win. This win propelled him into the lead for the points chase as well for 2015 EDT Racing Pro-Am Unlimited Class Championship. “I can’t say enough about Hoosier Tire for this round really hooking us up on this track that didn’t have any blue groove built up, and my DASA engine just putting down the power and getting me off to a great start and power for the lead. The start was pretty sketchy with four of us going in there all at once. I actually bumped into Jared (Hulliung) my teammate and didn’t want to take either of us out. I made a move around Chepkauskas and then made another move around Houghton after I trailed him for a few laps, and I was able to stay out front and protect my lines for the rest of the race. I’m really happy with how the weekend turned out for the Wolff Motorsport’s crew and we are excited for the rest of the season,” said Wolff. 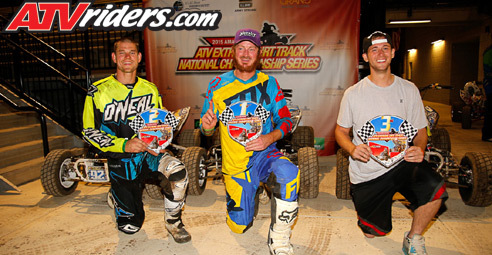 RATH Racing / Fox Shox / O’Neal’s Michael Houghton had another strong showing in the Pro-Am Unlimited class with a second place finish overall after battling hard with multiple riders over the fifteen-lap race. Houghton came off the line in what appeared to be a tough position coming into the first corner on the outside of a four-wide line but was able to tuck in behind Chepkauskas and found himself in second place coming into the infield. Houghton made his way around Chepkauskas and was the new race leader for a few laps. Houghton then did battle with Wolff who was on a mission to the front and eventually slipped back a spot and ended the race in second place on the podium. With this position captured, Houghton still remains a solid competitor in the class for the remainder of the season. 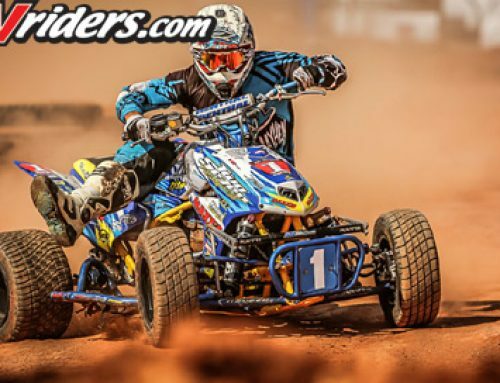 H&H Extreme / 2 Motorsports / EMiG’s Colter Loshbaugh is not a newcomer to the Pro ranks, however, he secured his first-ever podium this past weekend after also taking the win in his heat race earlier in the day. Loshbaugh was one of the front runners early on in the race but had his work cut out for him between the track and dealing with Houghton and Wolff who were battling around him as they charged to the front. Loshbaugh stayed on the gas for the remaining fifteen laps and pulled off his first-ever podium, for which he was very ecstatic! The next two rounds of the EDT ATV racing series is going to be in Sturgis because the TBA round slated for July 10-11th has been cancelled. 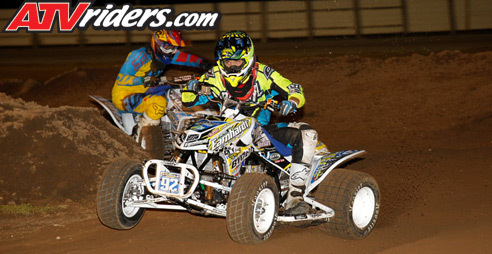 Check back here on ATVRiders.com for all the Extreme Dirt Track racing info and news!